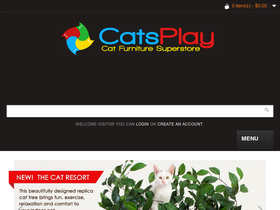 Keep your kitties purring with cat furniture from Cat's Play, online at CatsPlay.com. Visit for a huge selection of cat furniture, scratching posts, cat condos, kitty gyms, and much, much more. Be sure your new cat furniture will match your decor with 50 carpet color choices. In addition to furniture, you can find a range of pet beds, litterbox concealment options, and window perches. Fund your purrrfect price with top Cat's Play coupons, Cat's Play discounts, and Cat's Play deals from RetailSteal.com. Cat's Play offers free shipping on select items. Returns are offered, terms depend upon item purchase. See site for full details. Use this coupon code at Cat's Play and save $10 on all orders over $149. Use this coupon code on Cat's Play to save 20% on your purchase of KatKabin products. Shop for your pet at CatsPlay.com and take advantage of free shipping on select luxury pet carriers. Right now at CatsPlay.com, save up to 15% on select eco-friendly pet products. Click link to shop. Keep your cat happy with some new cat furniture from CatsPlay.com, now with free shipping on select items. Give your pet a home with free shipping on select wooden dog and cat houses from Cat's Play. Choose Cat's Play for your shopping needs and enjoy $4.95 flat rate shipping on all purchases. Save $5 on your Cat's Play purchase with this coupon code!